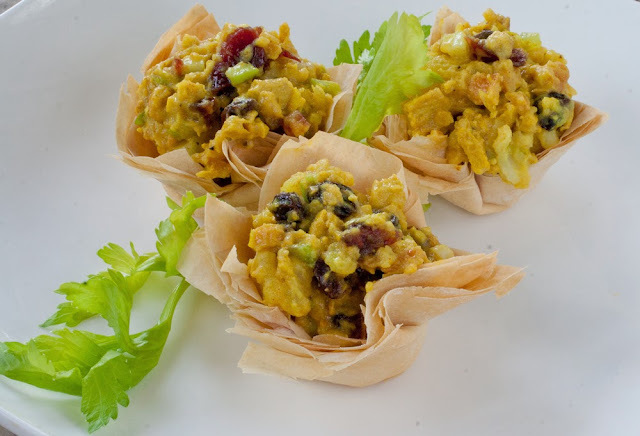 Curried potato/chik'n salad in mini flower filo cups. This was a success recipe for appetizers! The elegant mini flower cups made of Filo Pastry Sheets are a beautiful presentation for potlucks and parties. It is a bit complicated to make the flower cups but it was worth it. As a short cut, there are ready-made filo cups you can buy in super market frozen section. I decided to make my own and share with you how to do it at the end of this blog. 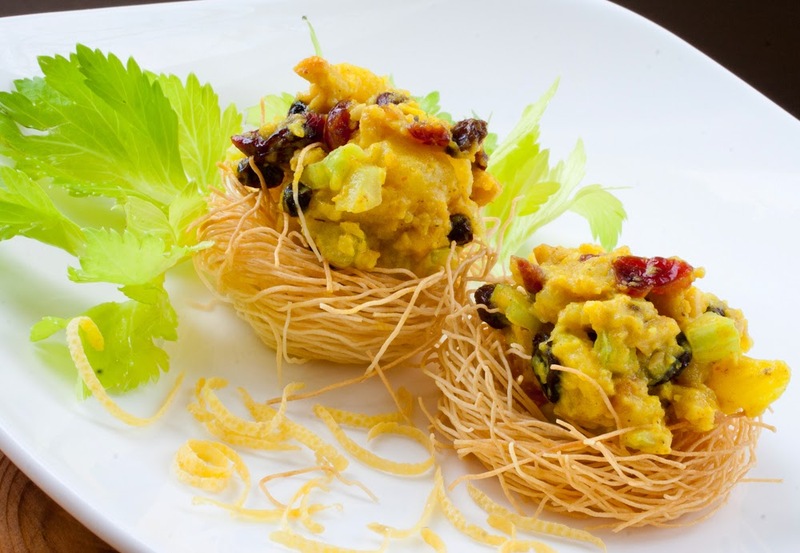 This appetizer can also be served on filo bird nests. It looks elegant and great for parties. I made my own bird nests from shredded filo dough called Kataifi. Honestly, this looks complicated but it is easier than making the mini filo cups. I have pictures and instructions below. You can buy the shredded filo dough in a 1 lb. box in frozen section in a Middle Eastern market. Curried potato salad on filo bird nests. This appetizer can also be served on crostini which is much easier to do. 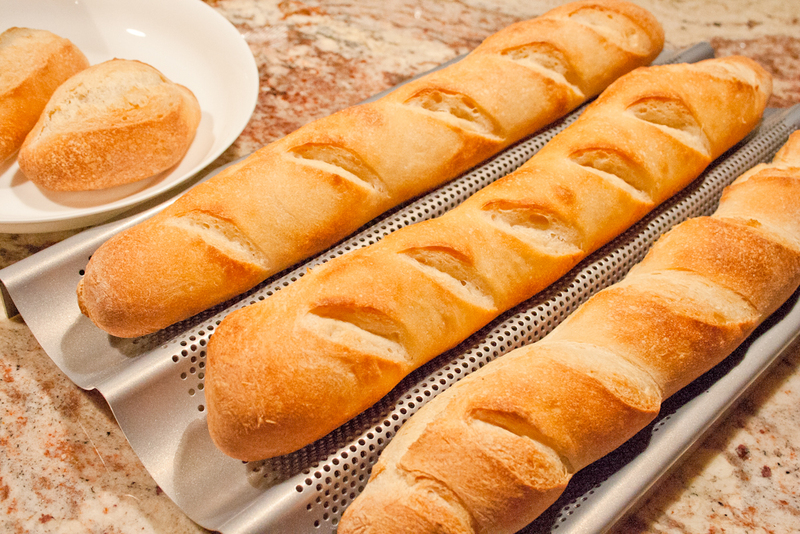 Just slice a baguette or whole grain bread thinly, about 1/4 inch, and then toast them. Either way is great. 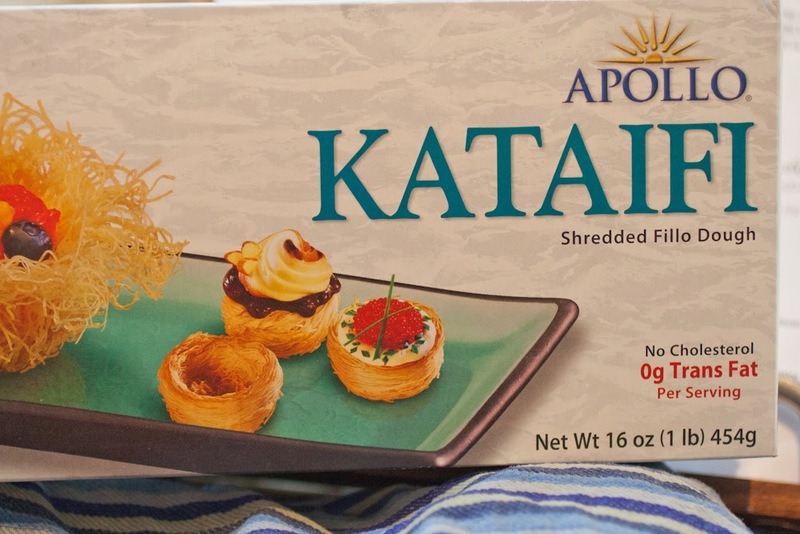 However, I love to bite into crunchy baked phyllo pastry cups much more than toasted bread. Curried potato/chik'n salad on crostini. This curried potato salad can also be converted to curried 'chicken' salad (soy chicken, soy curls, etc.). Or it can be a combo of potato and soy chicken, like what I did here below. 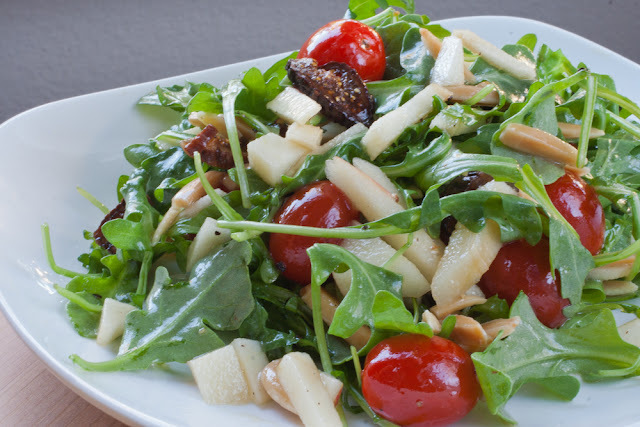 The other ingredients are roasted unsalted cashews, dried cranberries, currants or raisins, and fresh celery which added the crunchiness and chewey-ness of the salad. The lemon juice and rinds added the sourness to the salad while the maple syrup, currants and dried cranberries added the sweetness to it. 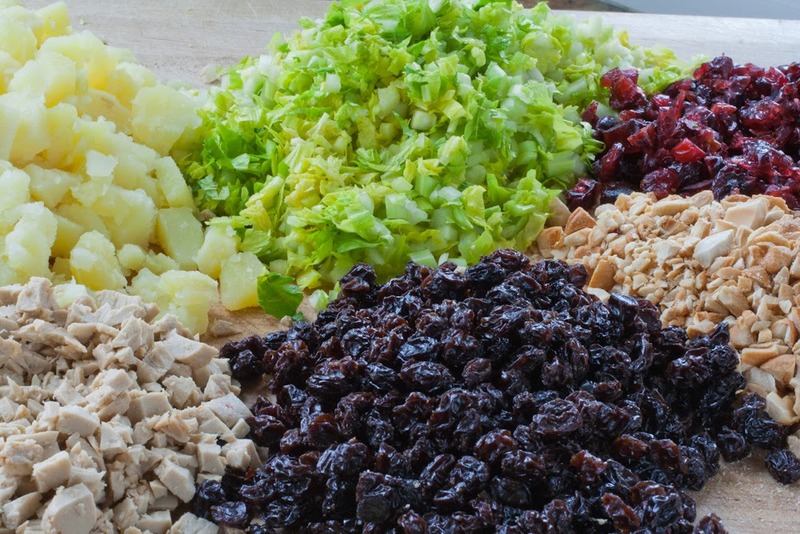 Ingredients(from top left corner clockwise): cooked potato, celery, dried cranberries, roasted unsalted cashews, currants, and soy chicken (optional). The ingredients are chopped in small pieces. I also chopped the roasted cashews and dried cranberries. However, I left the currants whole since they are kind of small. However, if you use raisins, I would recommend to chop those too. The idea is to have all ingredients in the same size. Peel and boil/steam potatoes in water for 25 minutes. Make sure that potato is cooked but still firm, not mushy. Let it cool. While potato is cooling, chop all the ingredients into uniform small-size morsels. Prepare the salad dressing by combining all dressing ingredients in a small bowl until they are thoroughly mixed. Chop cooked potatoes into small cubes. Heat sesame and vegetable oil in a large saucepan. Add curry powder, stir. Then, add potatoes or small cubes of soy chicken. Stir and combine with the seasoning and oil for 1-2 minutes. Take it off heat and let it cool. Add all the salad ingredients into the seasoned potatoes. Add combined salad dressing. Toss and combine everything together. This filling can be kept in the fridge and prepared ahead of time. Fill mini flower filo cups or bird nests with 1-2 tablespoons of salad each OR spread 1-2 tablespoons of salad on crostini. Best served immediately or up to 2 hours. Similar to the filling above, these flower cups can be prepared ahead of time then stored in tight containers for a few days. On the day of the event, fill them up with the filling above about 1-2 hours before the event. Use a pastry brush, spread oil onto a layer of filo pastry, then top with another layer. Repeat until 4 layers are piled on top of each other. Brush the top layer with oil. Cut oiled filo sheets into uniform sizes 3 x 3 inches. Repeat steps 1 and 2 until there are enough for 36 flower cups. 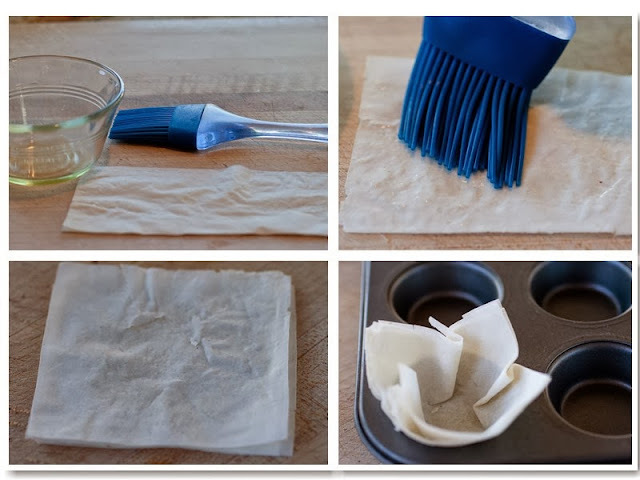 Form into a cup on a mini muffin pan(oiled side down). These can be done in batches. Bake at 350 F for 15 minutes or until golden brown. You will need 1 lb shredded filo dough or called Kataifi. Please follow the instructions on the box to thaw it before you start. 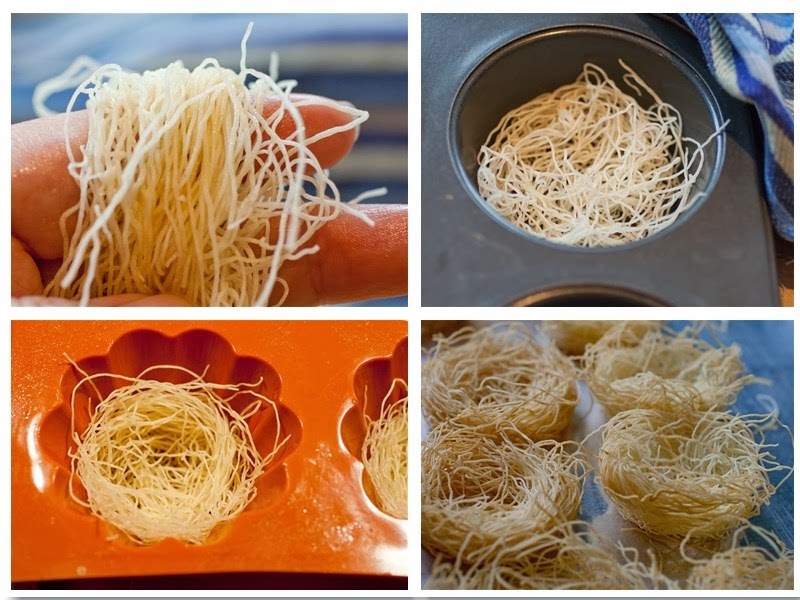 These filo bird nests can be prepared ahead of time then stored in tight containers for a few days. On the day of the event, fill them up with the filling above about 1-2 hours before the event. Shredded Filo Dough or Kataifi found in a frozen section in Middle Eastern market. Separate strands of shredded filo, cut into about 5 inches long. Use a damp cloth to cover the rest of the shredded filo dough while working with some strands to form the bird nests. Spray the filo strands with oil spray. Wrap the sprayed strands around 2 fingers to form an O shape. Repeat step 1-4 and fill out all the pans. Bake in 350 F (preheated oven) for 10-15 minutes or until golden brown. Use a fork to gently lift the nests out of the pans. Let them cool then store in a tight container or serve. How is the weather at your end? It is hot and humid where I am. I tend to eat more salads; therefore, this blog is simple and to the point. I consumed a similar type of salad last July at a banquet of a friend's daughter's big wedding. A few vegan items were served at the wedding and I like the salad containing arugula, chopped apple, sliced dried black mission figs, roasted almonds and refreshing, citrus-y, pungent dressing. It was really good that I had seconds of the salad. Since then I have recreated it at home and added more items into the salad such as grape tomatoes and cannellini or great northern beans. I named it Arugula and Figs salad even though there are more than just arugula and figs in it. I really love the salad ingredients combination. The additional of white beans added an earthy taste to it. This salad can be a light meal by itself and is a great meal to eat and prepare during the hot weather. I am using Made in Nature Black Mission Figs (dried and unsulfured). This product is also organic and non-GMO. I suppose you can use fresh figs but somehow I like the chewy dried figs in the salad. The texture is in contrast with the crunchy chopped apples and roasted almonds. 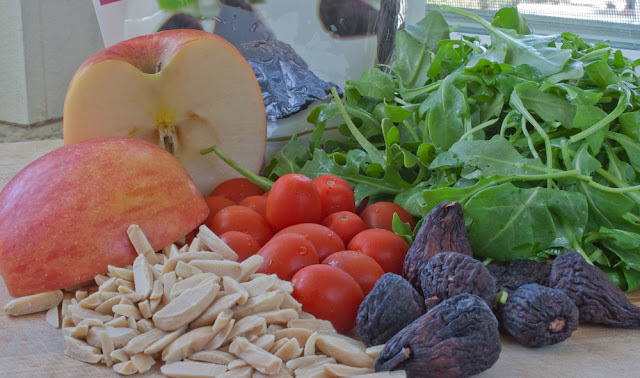 From left, clockwise: Fuji apple, arugula, dried figs, grape tomatoes, and roasted blanched almonds (beans are not pictured). For the salad dressing, I use my favorite Roasted Walnut Oil and Orange Muscat Champagne Vinegar from Trader Joe's. You can use other vinegar such as Fig Vinegar, Rice Vinegar, or any other white vinegar. Additional squeezed of fresh orange or lime are nice but they are optional. I have done it without the citrus juice and it is delicious. You can also use other type of oil such as olive oil, almond oil, grapeseed oil, etc. 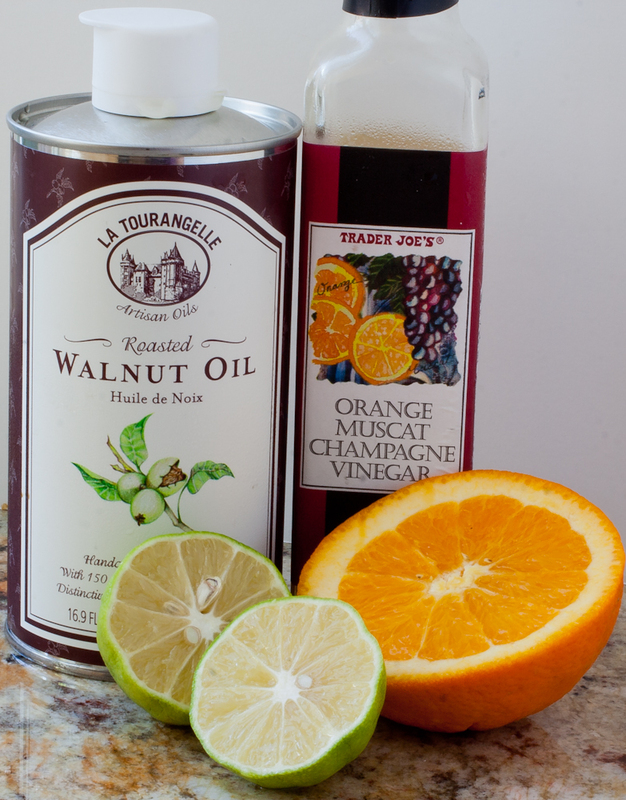 Roasted Walnut Oil and Champagne Vinegar are my favorites. 1/2 tsp. freshly ground black pepper. Combine oil and vinegar, whisk until the mixture is emulsified. Add agave nectar, salt, black pepper, and citrus juice. Combine by a whisk again and set aside. 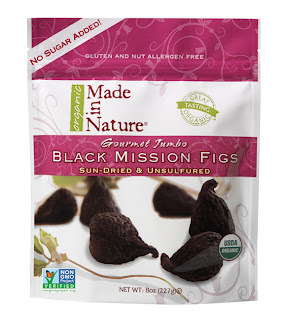 Slice dried figs crosswise thinly, remove the tough stem and top. Combine with other salad ingredients. To keep chopped apples from browning, you can squeeze some lime juice on them and combined. At serving time, combine the salad dressing and toss. I have been playing with glutinous/sticky rice (they are also called sweet rice) in my kitchen. I am using my favorite rice cooker to cook the sticky rice. I just love cooking sweet/sticky rice this way, the modern way, because traditionally, cooking sticky rice is a long process. The traditional way of cooking it is explained: here and here which involves rinsing, soaking (for 6-8 hours), and steaming for 45 minutes. That's how I used to cook them. Due to the steps involved I seldom cook them. After acquiring the 'best in the world' rice cooker with induction cooking and Neuro Fuzzy logic that has the SWEET rice setting, the traditional cooking method is thrown out of the window. 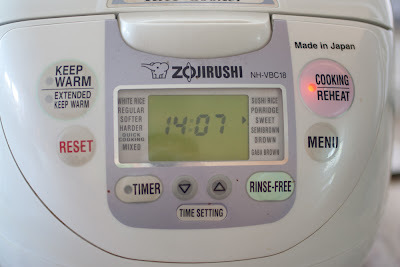 It is so EASY cooking rice: measure and rinse rice, put them in the rice cooker, add water (measure accordingly), and push button. Basically, I can have sticky rice anytime I want without the planning and soaking them before hand. If you don't have the fancy rice cooker, cooking it the traditional way is the way. This kind of Thai dessert, sticky rice and mango, is popular in Thai restaurants in my area. Restaurants can charge from $5.95 to $6.95 per plate. However, you can be the judge on how cheap and easy it is to make it at home. 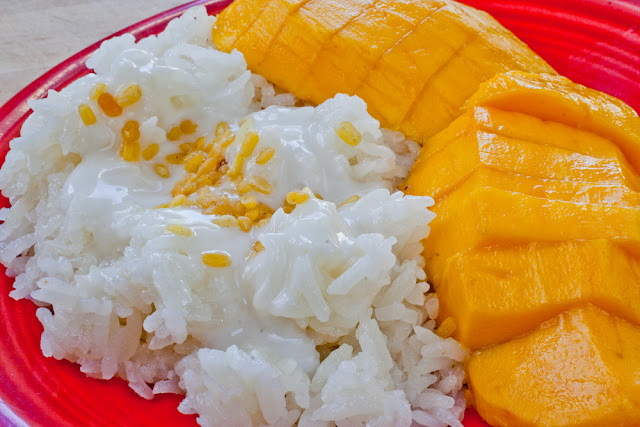 The white sticky rice and mango is what restaurants usually serve. However, I believe that the black one is more nutritious. Therefore, I presented both kinds in this blog. I prefer the black one which is more chewy and grainy. 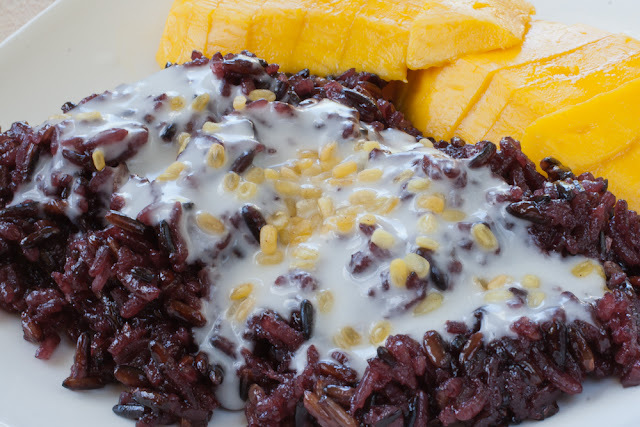 The black rice is more of a dark purple since it is a combination of the black and white sticky rice together. The other reason for blogging this dessert now is because Champagne/Ataulfo mango is in season. Champagne mango is my favorite kind of mango. The ingredients listed below can be found in Asian market. From top left to right, clockwise: Coconut oil (I used Trader Joe's), Aroy-D coconut milk for DESSERT, Champagne/Ataulfo mango, Thai white sweet/sticky/glutinous rice(black rice is not shown), split mung beans, and defrosted pandan leaves. Note: for softer black rice, soak in water for 6-8 hours. Note: rice cooker cup means the small plastic cup that comes with the rice cooker. Pandan leaves can be found in the frozen section in Asian market. Pandan extract also can be found in Asian markets. Note: coconut cream can be use and add water to thin it out. Note: tapioca flour is the best for this sauce, other thickening agent is not recommended. Rinse the rice (mix white and black for the black sticky rice) using a bowl, each time stir in fresh water and then drain them in a colander. Do this 3-4 times. Put drained and rinsed rice in a rice cooker. Pour water into the rice cooker just under the 2 line (for black rice pour in more water on the 2 line). Add salt, pandan leaves or extract, and coconut oil. Set it on the SWEET setting, push the Cooking button. 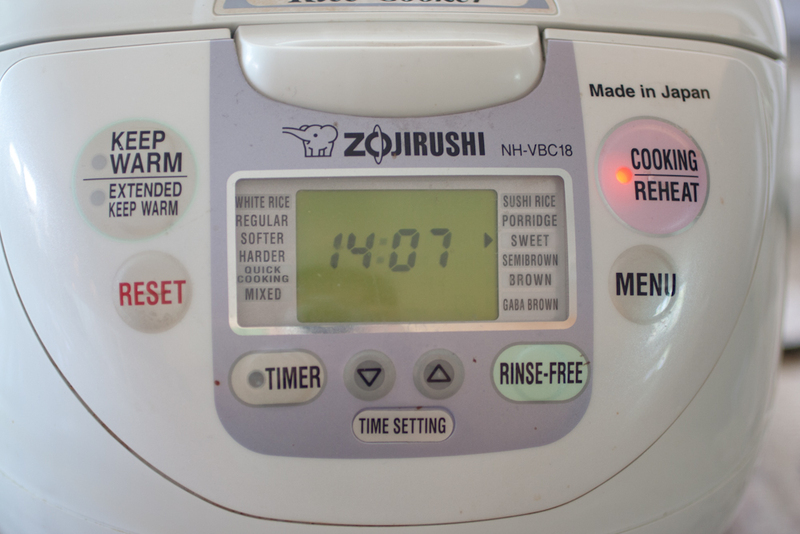 Rice should be ready in 25 minutes. Put coconut milk, sugar, salt, and pandan leaves or extract in a small heavy pan, stir to mix. Mix tapioca flour and water in a small bowl. Then, mix it into the coconut milk mixture. Cook on a medium low heat and continuously stirring for about 5 minutes or until the sauce coat the spoon and sauce is thickening. The mixture will start to boil but not hard boiled. Take it off heat and let it cool. Note: Do not allow sauce to boil on stove because the coconut milk will break. Drain split mung beans on a colander and pat dry with a paper towel. Heat a cast iron or non-stick pan on a medium heat stove. Toast mung beans in oil until crispy and brown. Drain on top of paper towel. Set aside. 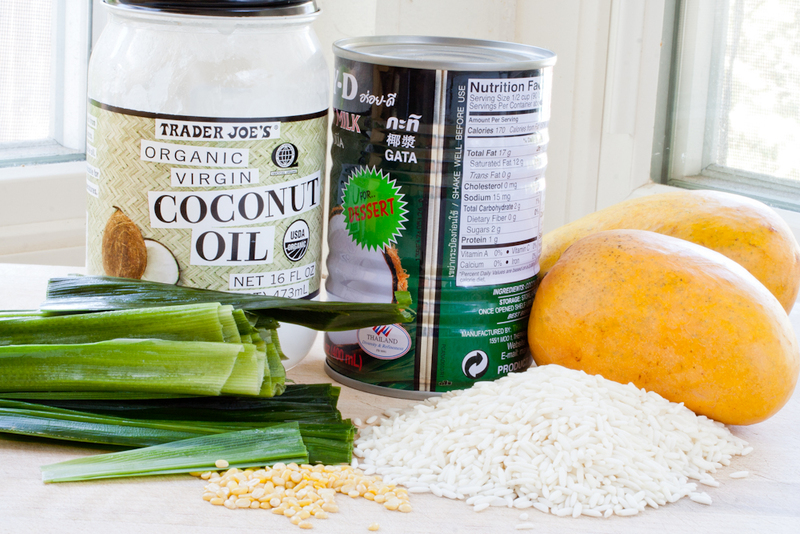 Once the rice is cooked and still warm, pour 1/3 to 2/3 cups of coconut milk sauce into the rice and mix. Another option is to add more sugar into the warm rice. You can sweeten it up to your liking. However, remember that the coconut milk sauce is already sweet. Serve rice warm, topped with coconut milk sauce, and mung beans topping. Peel mango, cut them up, and serve next to the warm sticky rice. I haven't been cooking lately because the weather is too hot. However, a post from Bryanna at Vegan Feast Kitchen blog about Vegan Spinach "Chicken" Patties (Open to Experimentation) prompted me to a new experiment with her recipe. I made it Asian style in my experiment and it became Vegan Cilantro Roasted Lemongrass "Pork" Patties instead of "Chicken" patties. I used the patties in Vietnamese Bánh mì with homemade Vegan Cilantro Lime Aioli and topped with traditional Bánh mì toppings(pictured above). 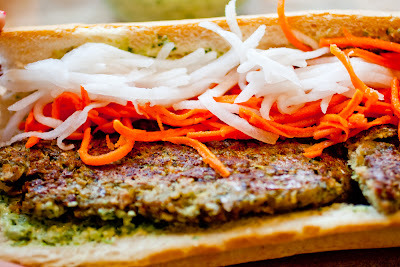 I grilled the patties on a cast iron skillet thus it became Vegan Grilled "Pork" Patties Bánh mì. I just want to warn everyone that this recipe is very cilantro-ey. Some people don't really like cilantro or coriander leaves. I love them. A lot of Vietnamese dishes use a lot of cilantro. If you don't like cilantro you may stick with spinach or parsley. I also did another experiment to make Candied Vegan "Ham" or "Bacon" using Chinese Style Vegan Smoked Ham I bought in Asian market. I also served the Candied "Ham" in Bánh mì with dijon mustard and topped with traditional Bánh mì toppings(pictured above, too). 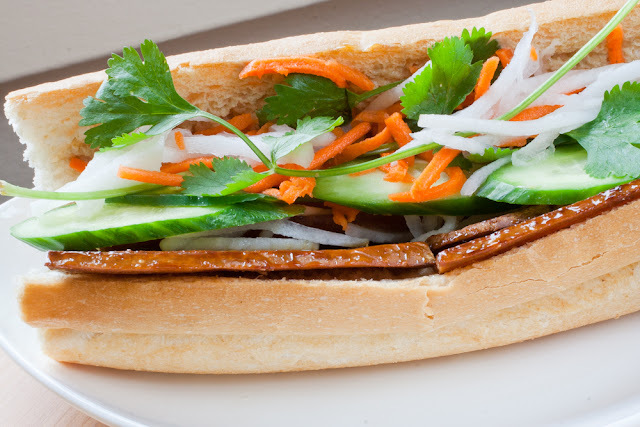 The traditional Bánh mì toppings are fresh cilantro, cucumber, jalapeno slices and pickled shredded daikon and carrots. 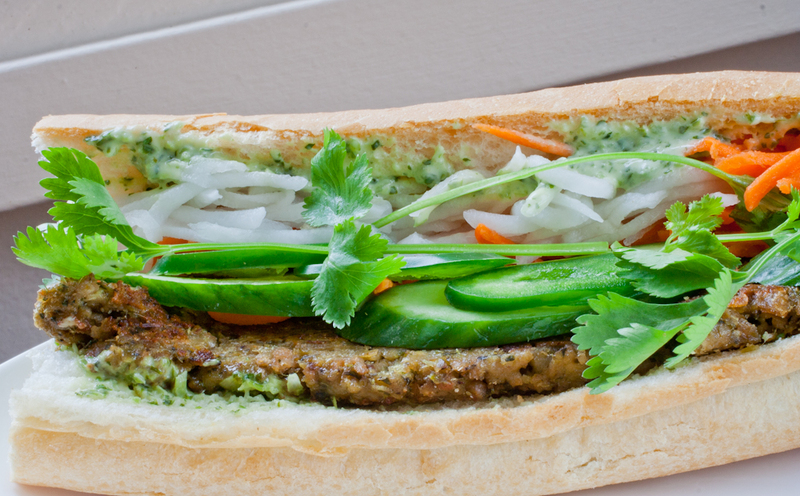 Ingredients of bánh mì toppings are: cilantro, jalapeno, cucumber, pickled daikon and carrots. Using a food processor, shred radish and carrots separately. In 2 bowls, 1 for radish and 1 for carrots, pile shredded radish and carrots, separately. Add 2 Tbsp vinegar in each bowl. Mix and let the radish and carrots macerated in room temperature or fridge. This sauce is great with a lot of things. I have served it with 'fish' tacos, sandwiches, and use it as a dip for tortilla chips. Put all ingredients above except the mayonnaise and blend until smooth. I store the Cilantro Lime mixture and the mayonnaise separately. Just before serving, I combine equal parts of cilantro lime mixture and mayonnaise until well blended. Note: a lot of Vietnamese dishes use ground white pepper as seasoning. 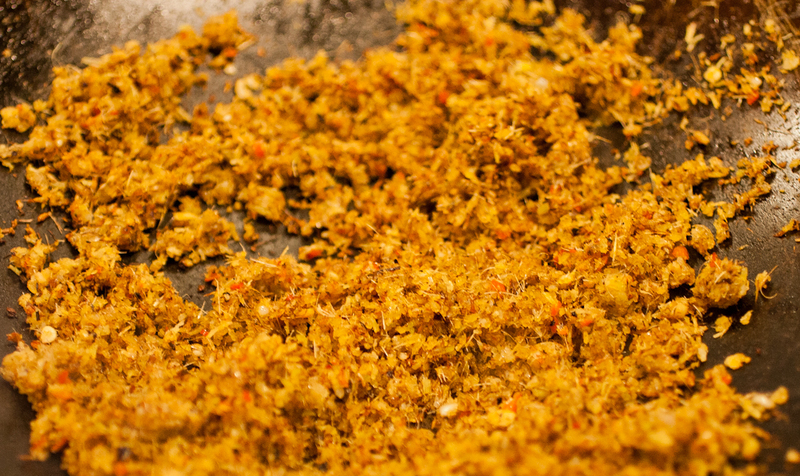 Start with a dry food processor, grind chopped lemongrass into a fine fibrous pulps. This may take 1-2 minutes. Add chopped shallots and garlic cloves. Process some more until it become a fibrous spice paste. Heat oil in a wok or on a cast iron pan, saute the spice paste on a medium heat. Stir fry for literally 10-15 minutes until the herb paste brown and roasted. Stir the paste frequently. When it becomes loose, brown, dry, and fluffy, turn off the heat and let it cool. (See the same method in making Lemongrass Tofu). While stir frying the lemongrass in step 2, mix the no beef broth paste with boiling water. Add to the TVP and let sit 10 minutes. Using the same food processor (you don't need to wash), grind fresh cilantro and green onions. Mash the drained tofu (squeeze out excess water) and mix well with the soaked TVP(squeeze out excess water), cilantro and green onion mixture, cool roasted lemongrass shallots mixture and the remaining ingredients, except the gluten flour. Mix thoroughly. Add the gluten flour and mix well again. Scoop up some of the "dough' and roll into a ball, then press down into a patty on a piece of baking parchment or silpat. I made it oval shapes because I am serving it in a baguette. There will be about 12-13 patties. Place the patties on parchment-lined or silpat-lined baking sheets, cover with foil and bake for 20-25 minutes. The patties will be soft when they come out of the oven. Let them cool on baking sheets. Cool or chill thoroughly in the fridge. They will firm up as they cool. Store in a container with parchment in between the patties and refrigerate or freeze for future use. When ready to serve, grill or brown them on both sides and medium heat on a oiled cast iron skillet. Using a loaf of store bought smoked vegan ham. I frequently perused Asian market in search of Smoked Vegan Ham. I often found one or two that is vegan. The one I purchased was VegeFarm brand. Slice thawed vegan ham vertically and about 1/4-inch thick. On a cast iron skillet, heat a tablespoon oil, pan fry a few ham slices until golden brown. Add 1-2 tablespoons maple syrup. Let syrup bubbles up and coats the ham slices. Cut about 6-8 inches of baguette and slice in half horizontally, almost all the way through but not quite. 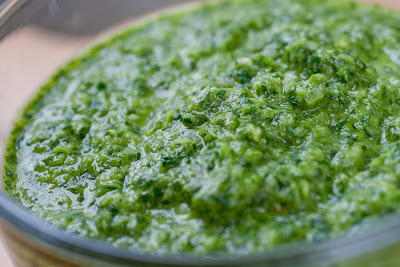 Slather with Cilantro Lime Aoli for making Grilled "Pork" sandwich or with Dijon Mustard for the Candied "Ham" sandwich. Add Grilled "Pork" Patties or Candied Smoked "Ham" slices, top with pickled shredded daikon radish and carrots, jalapeno slices, cucumber slices, and more cilantro. Veganized Javanese Gado-Gado without the sauce: steamed kale, cabbage, green beans, bean sprouts, underneath. Topped with steamed sliced potatoes, baked seasoned tofu, baked seasoned tempeh, fresh tomatoes, and fresh cucumber slices. Summer is almost here! I am craving salad type of dish and dishes that I don't need to spend a lot of time in the kitchen. I've been thinking about blogging Gado-Gado for a while now. Finally! Here it is! 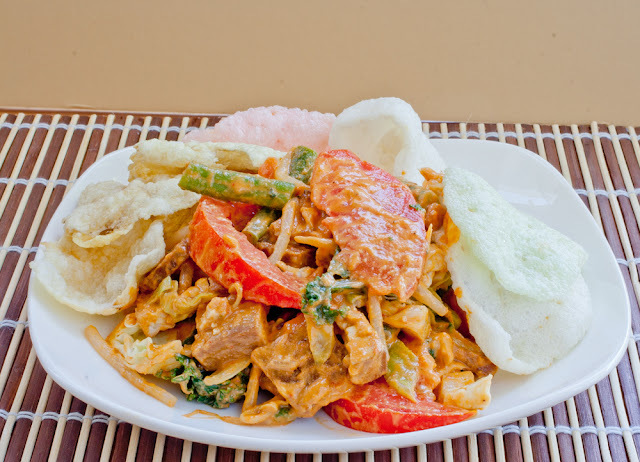 Gado-gado is an Indonesian Javanese salad consisted of boiled or steamed vegetable served with peanut sauce. It is a complete meal and usually served with lontong or ketupat (Indonesian rice cake) but it can be served without it. I believe that it is also gluten-free. When the salad ingredients are combined with the sauce, it looks like this one below. It is so delicious eaten with the garlic tapioca chips or kerupuk (the chips on the right side behind the salad) or emping (the yellowish chips on the left side behind the salad). 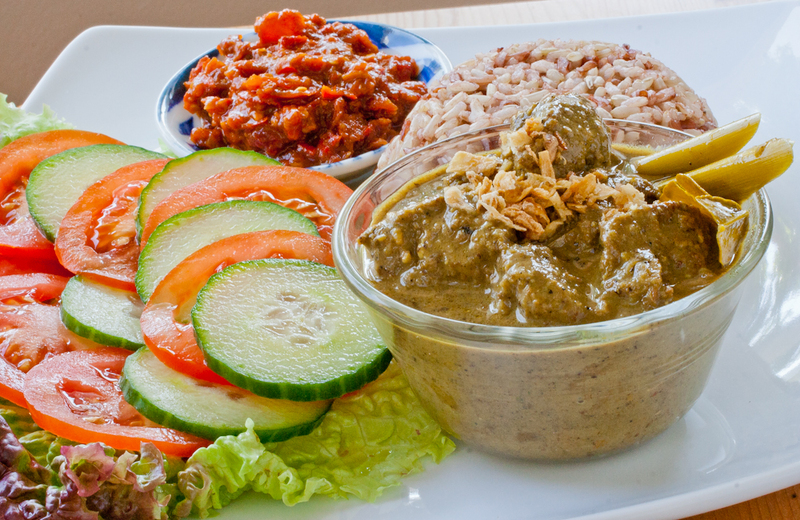 During college days, I worked in an Indonesian restaurant and my job was making gado-gado sauce. The restaurant cut corner by using creamy peanut butter (like Jif or Skippy) and then added hot water, sambal, brown sugar, and some minced garlic. In my opinion, it was disgusting to do it that way and that it was not authentic but since it is not my restaurant I just did what I was told to do. Customers liked it but they didn't know any better. It is not how I make it at home obviously. 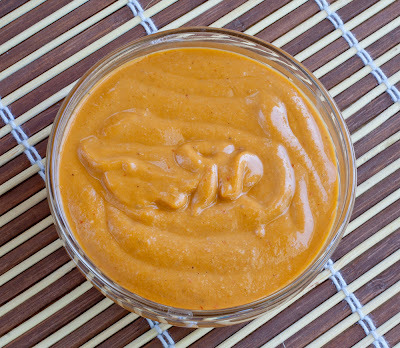 Sometimes I bought a packaged imported gado-gado sauce from Asian markets but the best is to make the sauce from scratch at home. The peanut sauce is the key to this salad. I like to use roasted peanuts and blend it using a Vitamix or a food processor with the other spices and herbs added to it. Although, if you want it easier and if you don't have a high speed blender, you can use Natural Peanut Butter(such as Natural Crunchy Peanut Butter from Trader Joe's), make sure that the ingredients are just peanuts and salt, not the one that has other ingredients in it like oil, sugar, etc. I usually buy Trader Joe's Lightly Salted Peanuts. I also use my own sambal that has no shrimp paste in it. However, you can also use sambal oelek which has no shrimp paste for an easier way. I will be adding sugar, salt, tamarind juice, lime juice, etc. but this way I can control the amount of sugar and salt. If I use a store-bought peanut butter that has sugar in it, I am pretty much stuck with the amount of sugar so I prefer not to. 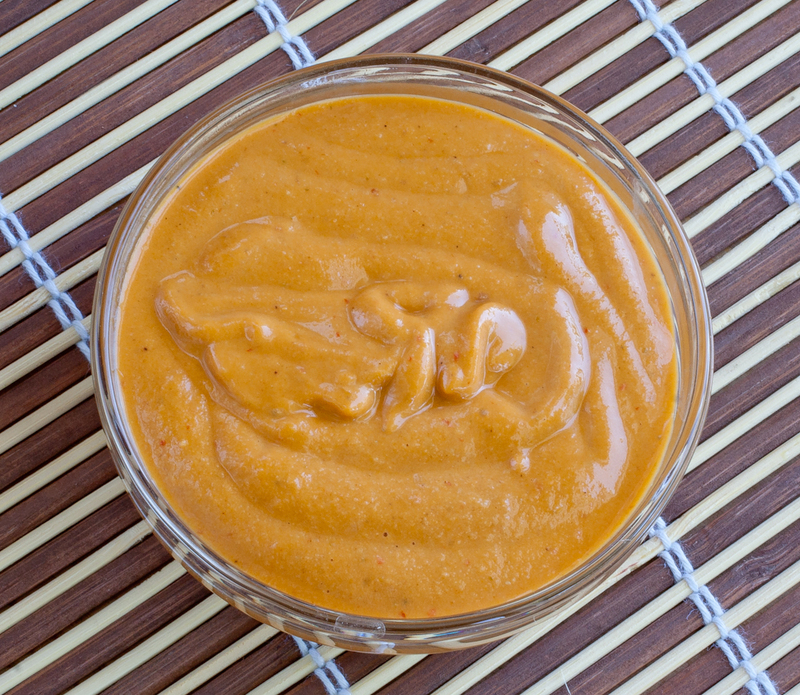 DH doesn't like sweet food and pretty much doesn't like peanut sauce made from store-bought peanut butter. He said that the Indonesian peanut sauce is too sweet. He likes my peanut sauce because I make it not too sweet and a bit on the sweet sour side with lime and lemon juice added to it. All kinds of vegetables that are good being steamed will be good for this salad. However, the traditional vegetables are long beans or green beans, cabbage, bean sprouts, spinach, and potato. I also like to steam the vegetables instead of boiling them. Fresh vegetable such as tomatoes and cucumbers are great additions too. The traditional gado-gado also uses boiled eggs which I don't use. The traditional way also use fried tempeh and/or tofu. 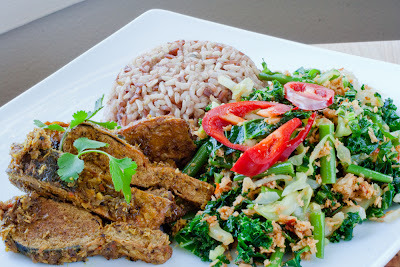 I use baked tempeh and tofu. Steam cabbage, kale, green beans, separately on a vegetable steamer or basket for 7 minutes each. Prepare a bowl of ice water. After each vegetable is steamed, immerse into the bowl of ice water to stop cooking. This way the vegetable will stay bright green and still a bit crunchy. Steam bean sprouts for 5 minutes and immerse into a bowl of ice water similar to step 1. Steam potatoes for 15-20 minutes until tender but still firm. Let them cool and then peel. Then slice into bite pieces. Note: regular soy sauce will do but this dark mushroom soy sauce is my preference. It makes the baked tofu dark chocolate brown but the inside is light cream color. Pretty and delicious! 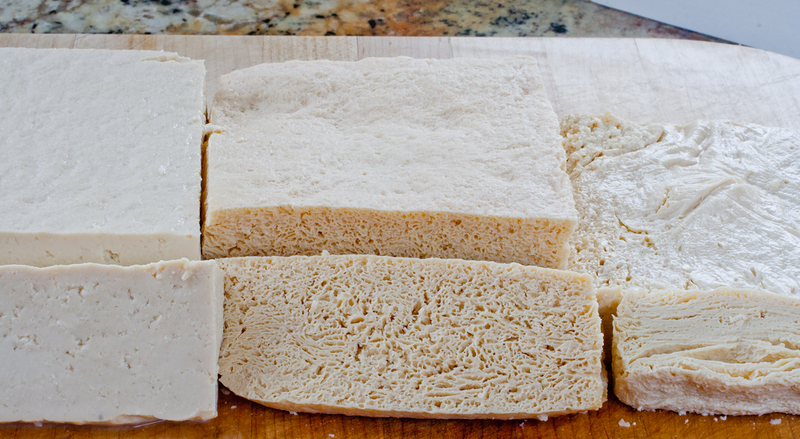 Slice tofu or tempeh about 1/3-inch thick lengthwise. Mix the rest of the ingredients in a plastic container with tight lid in which you can soak all of the tofu or tempeh slices in this marinade sauce. 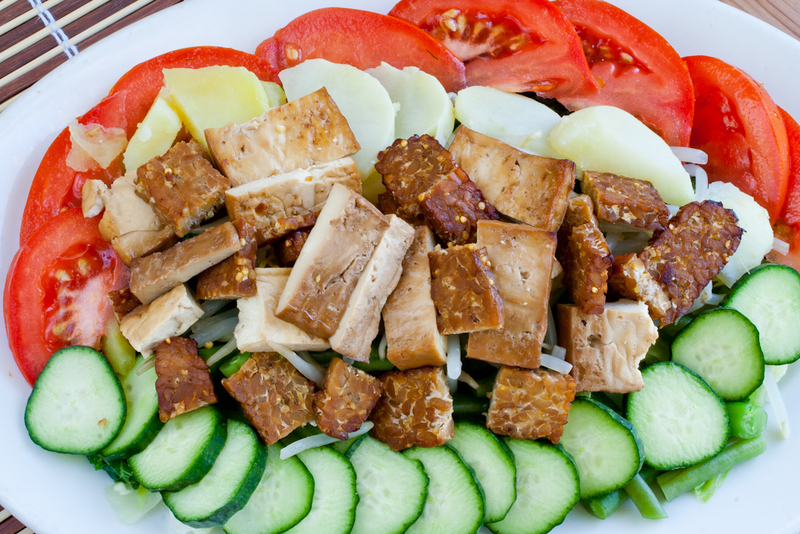 Marinate the tofu slices for 24 hours in refrigerator. 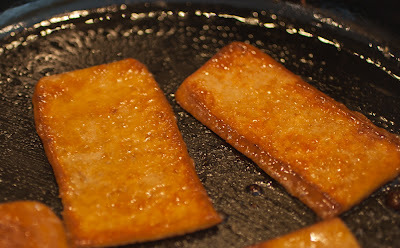 Bake drained marinated tofu or tempeh slices on an oiled cookie sheets for 10- 12 minutes in 400 F oven. Flip and bake the other side about another 10-12 minutes. Let them cool before use. Juice of 1 lime, about 3-4 Tbsp. Combine roasted peanuts, garlic, shallots, coconut milk, palm or brown sugar, tamarind juice, sambal oelek, salt, and miso in a high speed blender or food processor. Pulse and blend until desired consistency. Usually, it is the consistency of a gravy. Some people like a crunchier sauce. It is a matter of a taste on the consistency. If food processor or blender is not used and if using natural peanut butter, mince shallots and garlic finely, and then combine with coconut milk, palm or brown sugar, tamarind juice, sambal oelek, salt, and miso in a bowl or a medium size pot until thoroughly blended. Heat the sauce in a medium size pot until it boils, turn down the heat, and then simmer for about 10 minutes. If the sauce is too thick, add more coconut milk or water. Remove from heat, add the juice of lime, kecap manis, and squirt 1-2 Tbsp. of lemon juice. This step is optional to those who likes the sauce sweet. The amount of sugar can also be adjusted depending on how sweet the sauce to be. Add more salt if necessary. Let it cool before using and store in the fridge. When this sauce is cold (refrigerated), it tends to be very thick. Add warm water or reheat in a pot to thin it out. Gado-gado usually is served in room temperature. It is a great to prepare this dish ahead of time, store the ingredients separately in the fridge, then assemble just before serving. Combine vegetables in a large salad bowl (including the tomatoes and cucumber). Add peanut sauce and toss together. Sprinkle with fried shallots. Add garlic crackers/chips (kerupuk) and emping(padi oats crackers) on top or on the side. 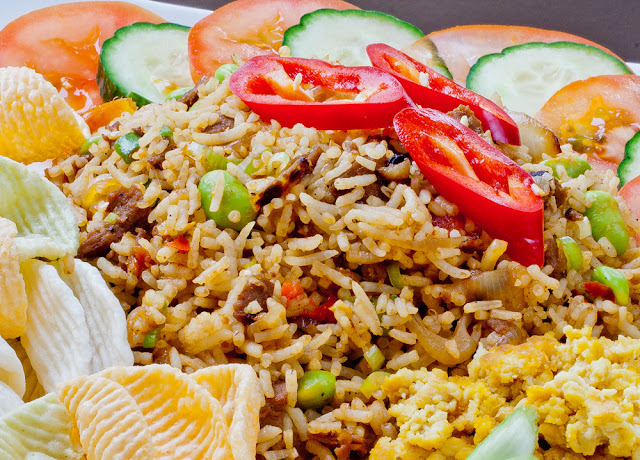 Indonesian fried rice also called Nasi Goreng (Nasi = Rice, Goreng = Fried) is different than any other fried rice. 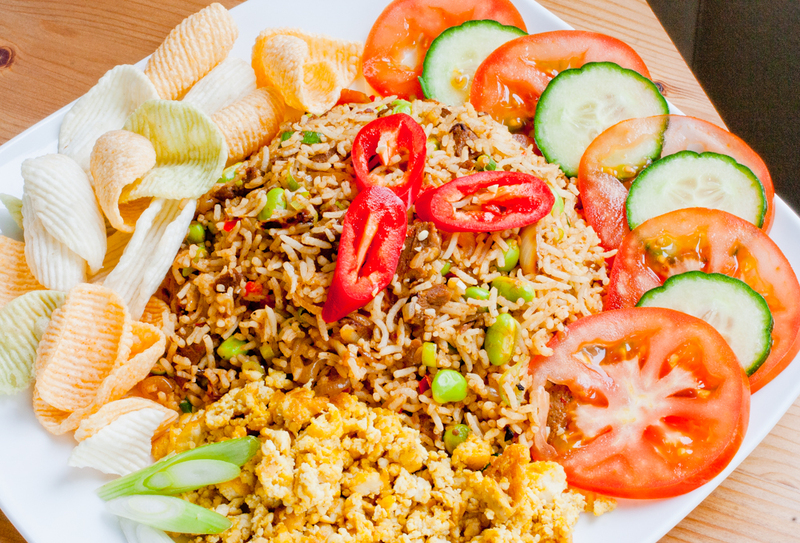 This Javanese fried rice is usually spicy hot and a bit sweet. We use Kecap Manis or sweet soy sauce to add the sweetness(Kecap Manis sounds like KEH-chuhp MAH-nees or similar sound to Ketchup Mayonnaise but there is no ketchup nor mayonnaise in this sauce). Traditionally, Indonesians eat this dish for breakfast with fried eggs served on top. The fried rice is always made from leftover yesterday's rice. Any leftover rice usually ends up as fried rice for breakfast the next day (Indonesians eat rice 3 times a day). This dish can also be found in lunch or dinner menu or at street vendors so it is not really just a breakfast food. It is usually meaty with chicken and shrimps. On top of egg, the other accompaniments are usually shrimp chips and cucumber and tomato slices. These accompaniments will counterbalance the heat of the dish. 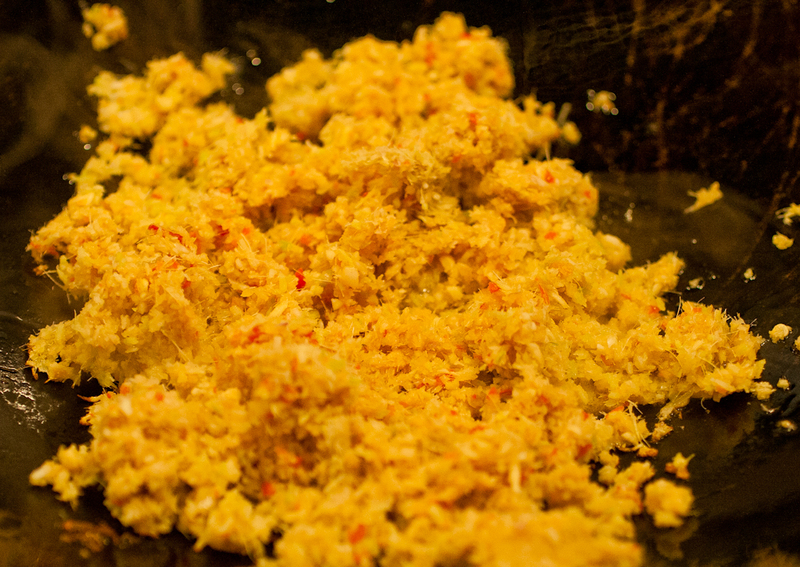 Watch this video on how a non-vegetarian Nasi Goreng is made. The video mentioned that Nasi Goreng is popular in Holland and a part of Dutch food. This is true since the Dutch conquered Indonesia for hundreds of years and brought this savory hot dish back to their homeland. I use white or brown basmati rice (long grain rice is the best for fried rice). I cooked and put the rice in the fridge the day before or use leftover rice and then break it down with hands (just like in the video). It is really important to do this before stir frying the rice. I used Gardein, Soy Curls, or Baked Tofu (store bought or home made). Sometimes, I use vegan shrimp but not always. I also love adding shelled edamame to it or frozen peas will do too. I used scrambled tofu as the egg and veggie chips instead of shrimp chips. 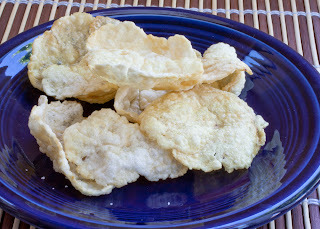 There are Indonesian garlic chips that are available that I could have deep fried just like what they did in the video but I was just too lazy to do the deep frying (make magic as the Chef in the video said). I used these Veggie Chips (available in Trader Joe) instead. The chips are great to use to scoop the fried rice. The crunchiness of the chips combined with sweet hot fried rice, scrambled tofu, and cucumber/tomato slices is pretty yummy! The use of sambal is really important. Sambal and Kecap Manis are the key to Indonesian fried rice. I love to make this fried rice when I have my Sambal Tomat (Spicy Javanese Tomato Sambal). Another kind of sambal such as Sambal Oelek or Chili Garlic Sauce can be used but homemade Sambal Tomat is just much better. For this dish, I tried making the scrambled tofu with The Vegg. It was good but I found that this product is pretty expensive. I have made scrambled tofu without it and turned out almost the same. 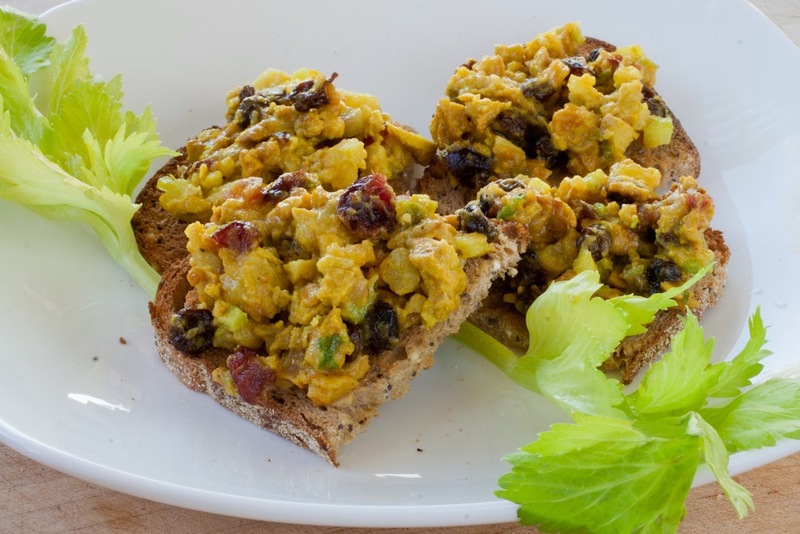 Any recipe for scrambled tofu is good to go. Above: Lemongrass soy/faux fish. 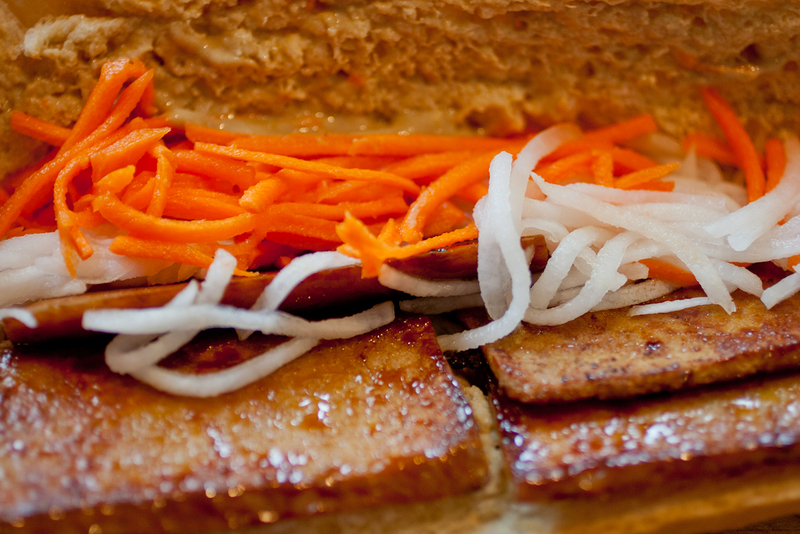 Below: Lemongrass tofu. 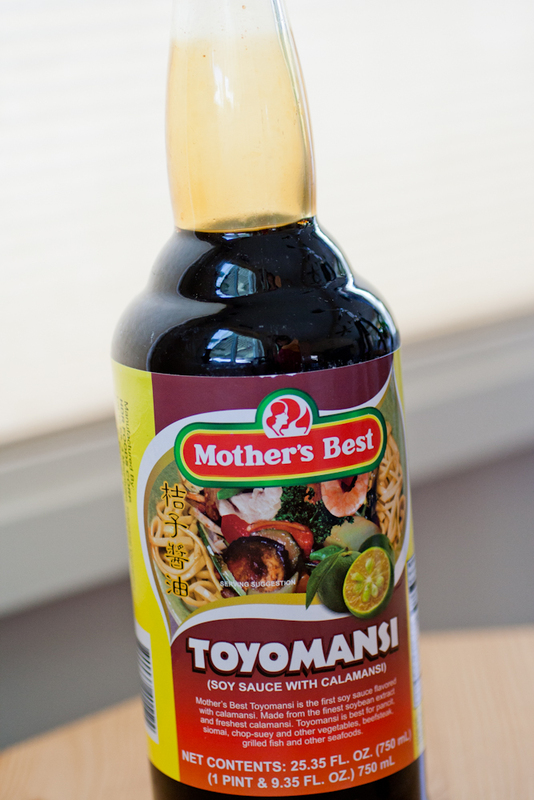 Toyomansi, a delicious fish sauce replacement. ﻿I thank my fellow vegan in fb for her suggestion. This sauce is quiet delicious. 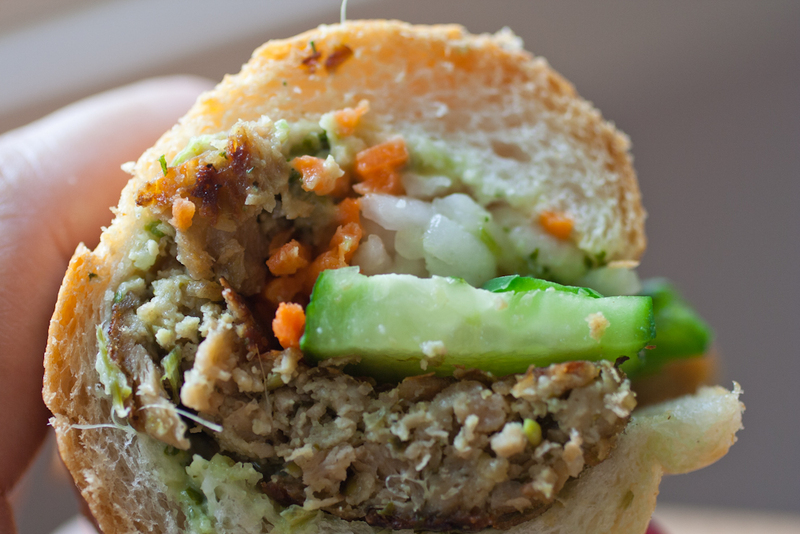 Another discovery, lately, for me, is a store with a lot of vegan faux meat in Monrovia, CA, called Vege USA. This Taiwanese based company for faux meat and seafood products has been in business since 1998. They were creating vegetarian products instead of vegan products. However, visiting the store (the headquarter has a small market or store) and talking to the worker in the store, this company is in the process to turn their products to vegan. There is a whole freezer section dedicated for vegan products. The process takes a long time but they are trying. I was able to get a good vegan soy fish from them. In the past, I made my own vegan soy fish but lately buying it is easier. Some people will say that they don't like faux meat or seafood. Oh well, I grew up eating fish and love the 'seafoody' flavor so I still enjoy eating faux fish. If faux fish is not your thing, you can make this dish with tofu. I suggest the extra firm tofu. I found that tofu can be bland in a stir fry dish unless I soak and marinade the tofu pieces first with the spices. I fix the problem by freezing the extra firm tofu first overnight and then leave it to thaw the next day on a colander. Before freezing it, do not squeeze the water out of the tofu. I usually take out the tofu from the box, wrap it in a saran wrap tightly and put it in the freezer. The water in the tofu will be frozen and crystallized so when it is thawed, it forms holes as pictured below. After it is thawed, I squeeze the water out and the tofu becomes spongy. 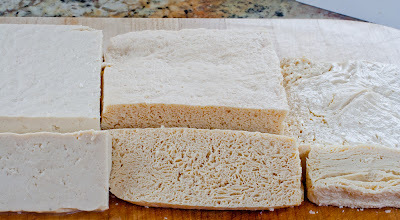 If the tofu is soft, there are a lot of water in the tofu so when it is thawed, the tofu reduced to half of the original size. For this dish, I prefer the extra firm spongy tofu. 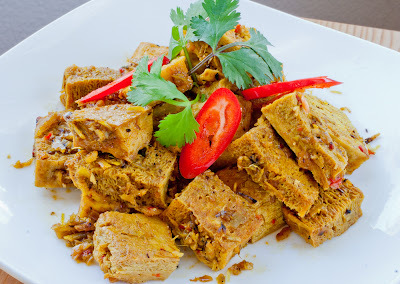 The benefit of using the spongy tofu is that the sauce and spices easily absorbed into the tofu so it is not bland. The tofu is really like a sponge absorbing the spice and sauce well. But then again, some people do not like the texture of spongy tofu. In that case, extra firm tofu can be used in this dish (without freezing and thawing). It is a matter of preference. Note: toyomansi or vegan fish sauce can be salty. Salt may not be necessary. Preheat oven to 425 F. Cut soy fish, tofu or spongy tofu to bite sizes. With a brush or oil -spray bottle, apply oil soy fish or tofu pieces (using ½ to 1 tablespoon of the oil). Bake soy fish or tofu until crispy, about 25minutes - for fish and 35 minutes for tofu, flip over about halfway of cooking. The fish or tofu should be brown and crispy. Set aside to cool. 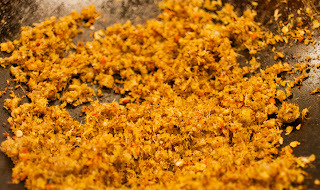 Using a food processor, grind lemongrass, garlic, shallots, optional red chili, and salt until it is very fine. Scrape the side a couple times to gather ingredients. The final result is a spice paste. Heat a large wok or nonstick frying pan on a medium high heat. Add 2 tbsp. oil. Then, immediately, add the herb paste (from no. 3). Stir fry this herb paste for 10 minutes. 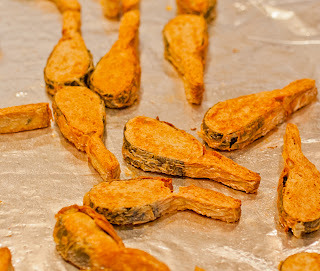 Be patient, this is dry frying process. It needs to be slightly brown and dry before continuing to the next phase. Add a little more oil or water if it starts to stick to the pan. The aroma of browned herbs will be delicious. Add baked soy fish or tofu and mix with the browned herbs, mix well and stir fry for 1-2 minutes. Add toyomansi or liquid aminos or vegan fish sauce, brown sugar, curry powder, and mix well with soy fish or tofu mixture. Add vegetable broth. Let the soy fish or tofu soak all the liquid and stir fry for another 5 minutes. Another option is not to use broth and have this dish as a dry dish. I like it both ways. Take it off heat and enjoy with my perfect brown rice and Indonesian Salad with Spicy Grated Coconut Dressing or Indian Kale-Cabbage Thoran. Baked soy fish until crispy. After: Spice paste was sticky before. After 10 minutes, it is brown, fluffy, and loose. Serve Lemongrass fish or tofu with brown rice, Indonesian salad, or Indian Thoran, a perfect combo. I am blogging Indonesian food again. My DGH (my dear gringo husband) likes Indonesian dishes so I continue with this trend to make more veganized Javanese dishes. He loves this Javanese traditional dish called Urap! 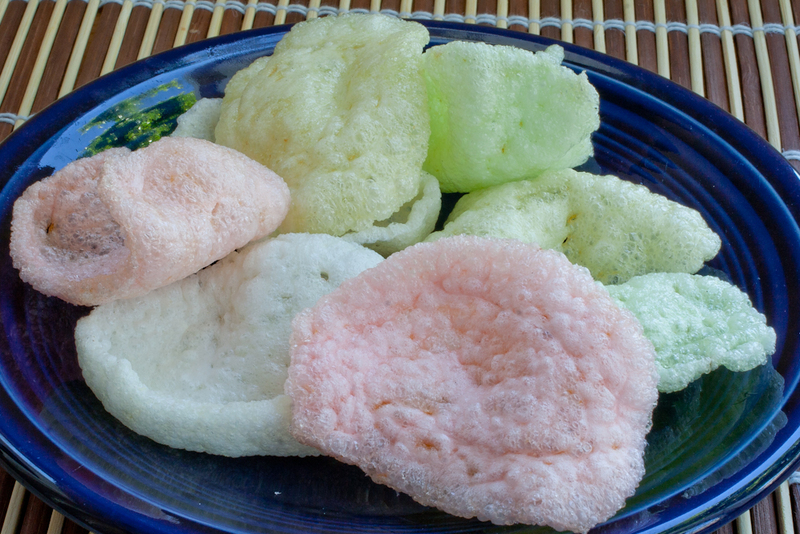 This one is a dish that Indonesians make for community celebrations such as birthdays, house warming parties, baby showers, weddings, bridal showers, etc. etc. It's great for potlucks or picnics since it can be served in a room temperature. 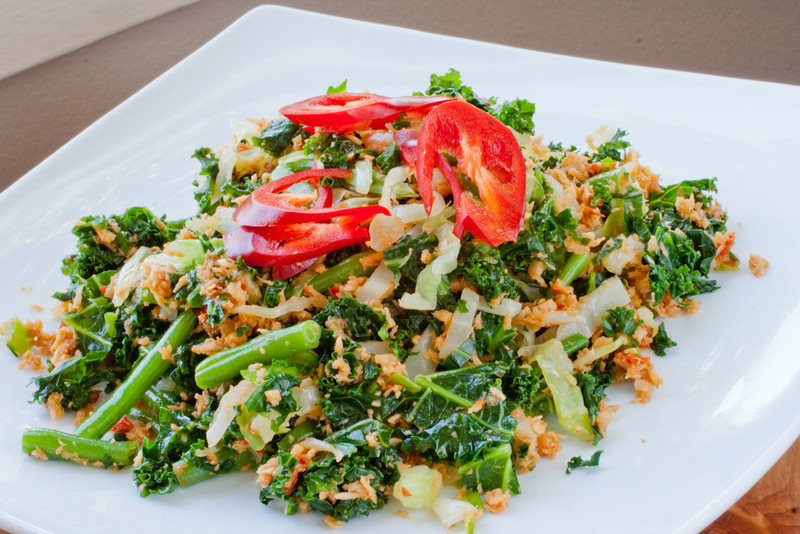 Just like the Koreans who bring Japchae into potlucks or picnics, Indonesians bring Urap. One reason this dish is great for potluck is that it is easy to make as long as the fresh (can be frozen and then thawed) grated coconut can be obtained. This dish is similar to Indian Kale-CabbageThoran that I blogged back in 2012. The title says 'Dry Dressing'. Yep, it is not like the Western salad dressing with oil and vinegar, emulsified. This dish uses thinly grated coconut, the thinner or smaller the better, as dry dressing. Usually, it is also spicy hot like sambal. However, the level of heat can be reduced by using my tip below(about the level of heat). I have trained DGH to eat spicy hot food but his is not at the level of heat I can take and I always make it less spicy for him. OMG, coconut became so popular in the US. The natural market in my neighborhood I go to sells coconut oil, coconut milk, coconut cream, coconut juice, fresh young coconuts, etc. Wow! I remember about 20 years ago I had to hunt down coconut juice or coconut milk in Chinatown when I wanted to make Indonesian dishes. 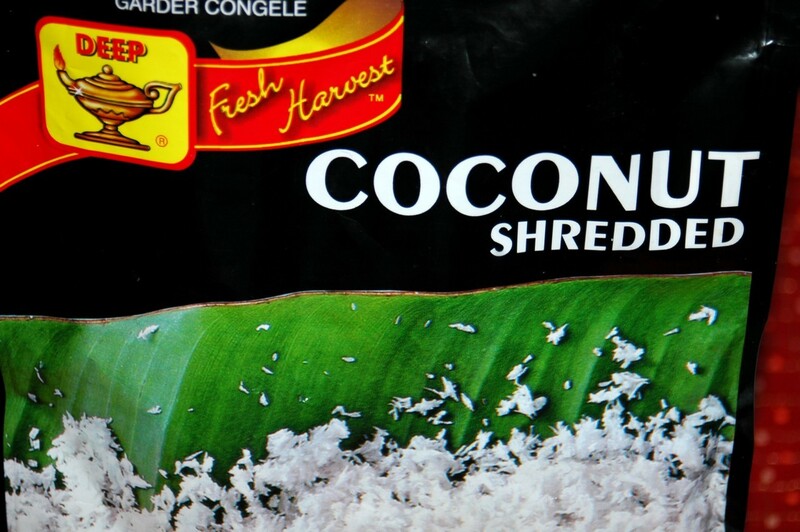 For this dish, I buy the frozen grated coconut(from fresh and not dried) at an Indian market/store. Actually, the guy at the Indian market sells fresh coconuts (not the young coconut) and is willing to break the coconut for the customers. I am just too lazy to peel and grate the fresh coconut. I could have done it with a fine spice Microplane grater. I am also hoping that my readers can find this kind of frozen grated coconut at a nearby Indian market. 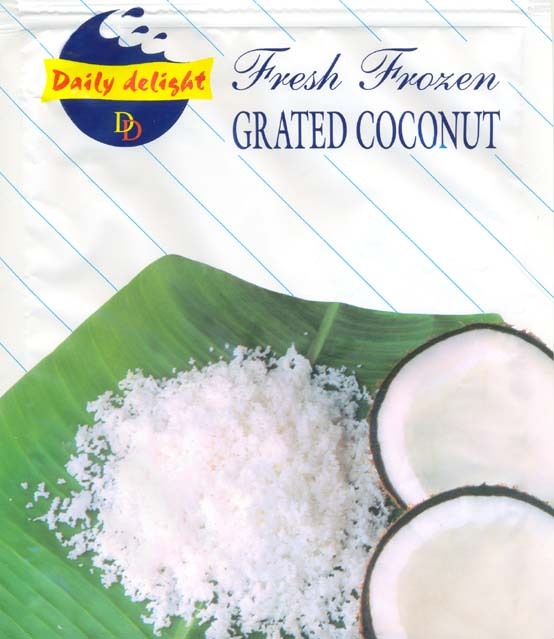 I haven't yet tried to prepare this dish with unsweetened dried grated coconut and reconstitute it with warm water. It may work, however, the taste is better if it is made with fresh coconut. Below are pictures of 2 different brands of frozen grated coconut in the Indian markets. Big chili is not hot! The smaller chili is hotter than the big one, that's for sure. The red small chili(fresh Chili Arbol) is SUPER hot (about 15000-30000 Scoville unit). Chili Arbol is not as hot as Habanero but it is pretty hot. I usually use 2-3 of this red chili per dish and it can be omitted altogether. The next level is the medium size chili such as red Jalapeno (basically, it is jalapeno that is ripened) which is medium hot. The mildest is the dried New Mexico(dried Anaheim pepper) that is reconstituted in warm water after the stem and seeds removed. New Mexico chili is readily available in most market, especially, Hispanic market. Therefore, it really depends how you like the heat. I combine the red small chili with 3-4 large New Mexico chili in my dishes. Sometime I combine the red Jalapeno with New Mexico chili. I always use the New Mexico chili since I like the taste(a bit sweet) and how it makes the dish red but not hot. 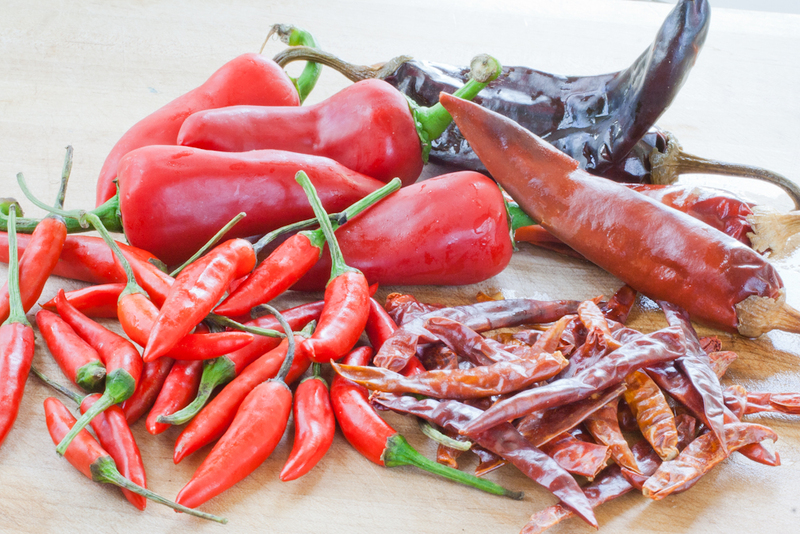 If fresh small red chili is not available, the dried chili called Chili Arbol can be used. They also need to be reconstituted in warm water. I have used this kind of dried Chili Arbol when the fresh ones are not available. Warning: always use gloves when handling chili or wash hands immediately and don't rub face or eyes. 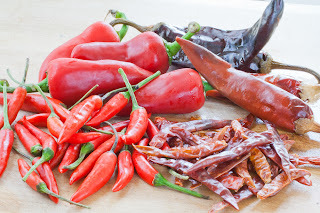 From lower right, clockwise: hot fresh chili arbol, medium red jalapeno, reconstituted New Mexico chili, hot red dried chili arbol. 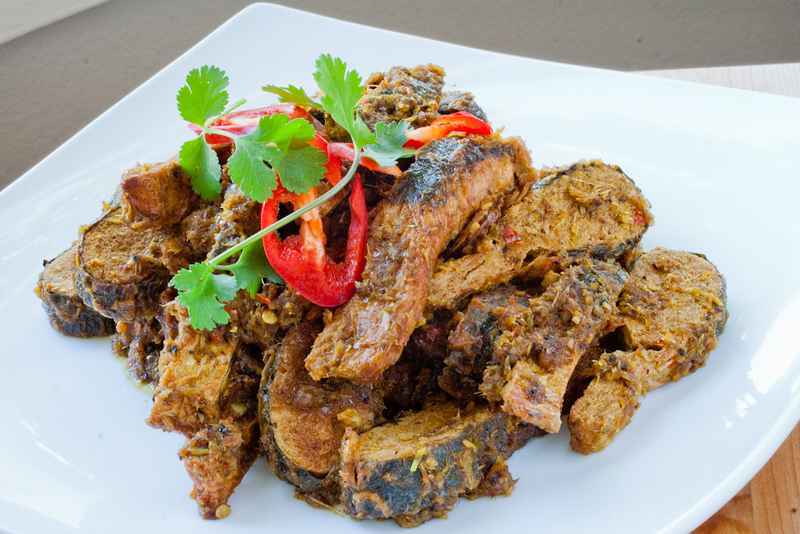 Note: traditionally, this dish is made with terasi or shrimp paste. I replaced it with miso. Using a food processor or mortar and pestle, grind garlic, shallot, salt, New Mexico chili, red hot chili/serrano chili until smooth. Add a little water or chili soaking water, a little at a time, until this mixture come into a paste. Combine the spice paste with the grated coconut, miso, and sugar thoroughly with hands or a large fork. Steam this dressing for 15-20 minutes. Set aside and let it cool. Note: the veggies are supposed to be lightly steamed, don’t overkill in the steaming process. Use a large steamer such as a large wok with bamboo steamer on top. Boil 4-5 cups of water. Once the water is boiling, pile in shredded kale, steam for 5-6 minutes. Take out the steamed kale and spread onto a cookie sheet for a quick cooling. Repeat step 2 and 3 for cabbage, green beans, and bean sprouts. Bean sprouts takes only 3-4 minutes. Each time spread steamed vegetables on a cookie sheet for a quick cooling. Mix the lightly steamed vegetables and dry dressing when everything is COOL. 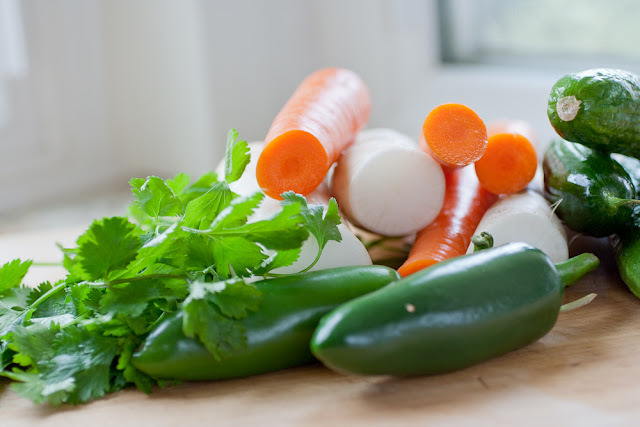 Combine dressing and veggies thoroughly and serve in a room temperature. Add salt if necessary. Store in the fridge but let it out on a room temperature or heat up in a microwave for 1 minute before serving. Just like Indian Kale-Cabbage Thoran, this dish is usually better accompanied with somekind of fish dish. The Lemongrass Soy Fish is a great companion. The Indonesian food cravings still exist in my system. 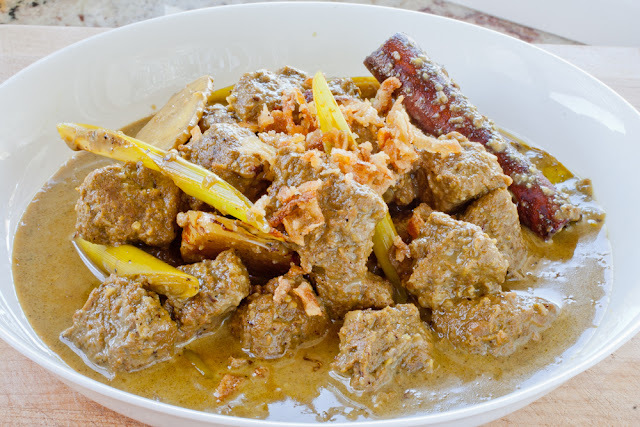 I crave Indonesian ethnic dish such as this one Indonesian Lamb Curry or called Gule or Gulai. I think I am craving the spices and not craving to eat the lamb/goat or meat. The curry taste is pretty unique. I can't really compare it with Indian curries since the spices are similar to Indian but we, Indonesians, add fresh herbs to it like galanga, kaffir lime leaves, bay leaves, and lemon grass. 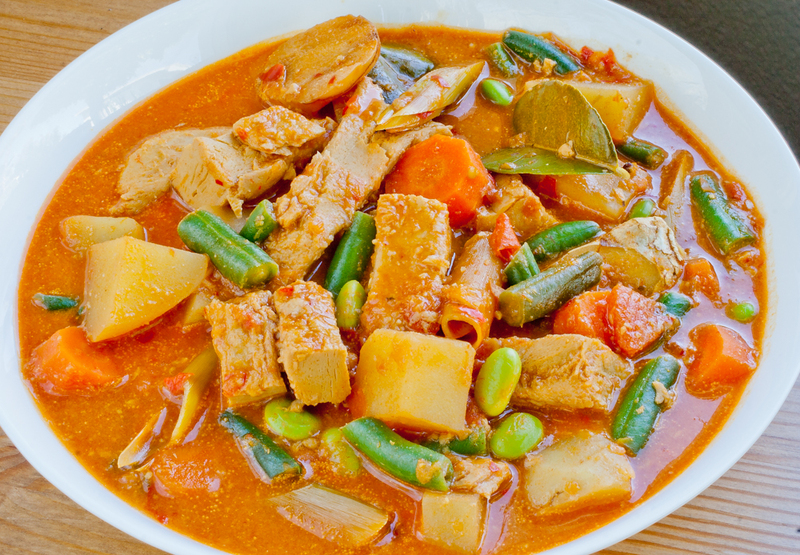 It doesn't taste like Thai curry either since spices like cloves, coriander, cardamom, and cumin are used. Is it a fusion between Indian and Thai curry? Maybe, that's the only thing I can describe it. 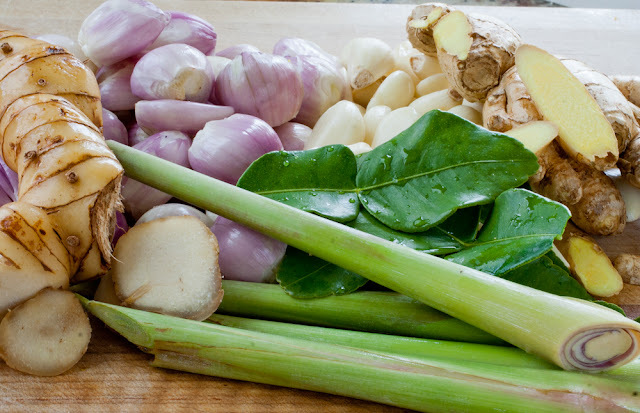 Herbs used in Indonesian dishes(from left to right, clockwise): galanga, shallots, garlic, ginger, kaffir lime leaves, and lemon grass. I opted to use fresh herbs as much as possible. Living in Southern California makes it easier to do that since I can find them easily in Asian markets. In fact, if you read my previous posts, I grow my own lemon grass and kaffir lime. These plants are thriving all year long in my backyard and I just pluck them whenever I need to cook Southeast Asian dishes. In the past, I often cook Indonesian dishes by buying store-bought spice paste like Bamboe, Munik, or Indo Food. It is supposed to be easy. I can just stir fry the spices, add other ingredients, add coconut milk if needed, and voila, an Indonesian dish is done. However, lately, I found out that these spice companies started adding MSG although sometimes it is not listed in the ingredients list. In fact, they started to do that on Indonesian snacks and chips, too. Urrrgh! I am not sure either if terasi or shrimp paste is included but not listed. Therefore, I decided to make my own spices and learn to cook it from scratch which is more elaborate but believe me the taste is better homemade. Tools needed: mini chopper/spice grinder, a food processor or a mortar and pestle as shown in my previous post. Note: The Gardein Beefless Tips are the best for this dish. A friend of mine said 'I can fool a meat eater using these'. Note: I suppose you can use all ground spices to start with. However, I prefer to temper my spices on a hot cast iron and then cool them before grinding. Lalapan or fresh cut tomatoes, cucumber, lettuces, green beans, etc. 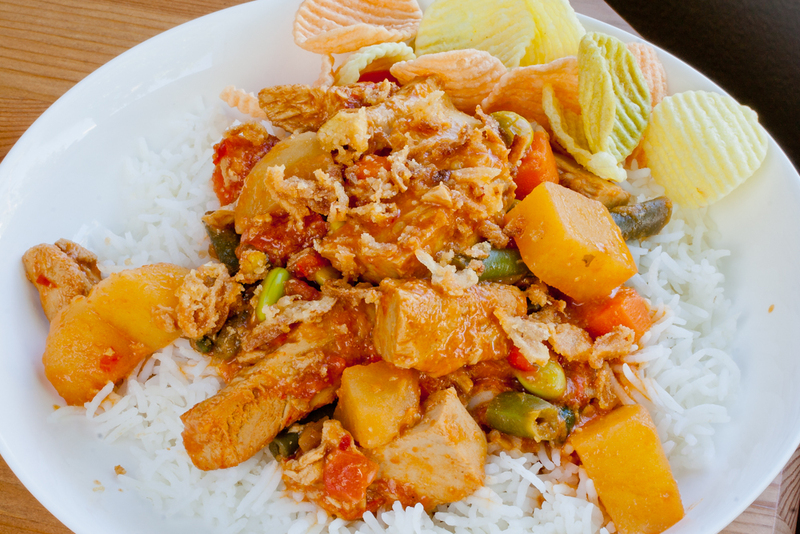 Note: Lalapan means eating rice, meaty dish, and fresh vegetables with sambal. If using firm tofu or tempeh, pan fry cubes in oil or sprayed with oil and baked them in 400F oven for 15 minutes to brown them. Set aside. This step is to firm up the tofu or tempeh as they will be simmered in curry sauce. Combine all spices and blend until smooth in a spice grinder or in a mortar and pestle. Into a mini chopper or a food processer or the mortar, add candlenuts, shallots, and spices above (no. 2) and blend into a spice paste. Add a little water if necessary to make the paste. In a heavy bottom pot or a wok, add 2 tbsp. oil on a medium high heat. Add spice paste and pan fry for 5 minutes until fragrant. Be patient to stir fry the spice paste since this step release the aroma for the curry. Add fresh herbs: ginger, galanga, kaffir lime leaves, lemon grass. Also add the cinnamon sticks. Combine them with the stir fried spice paste for another 3 minutes. Add Gardein Beefless Tips or cubed tofu or tempeh. Combine the spices and herbs with this ingredient for another 3-4 minutes. Add coconut milk, water, salt, and palm or brown sugar. Add more salt or sugar to taste. Serve with rice and accompaniments. 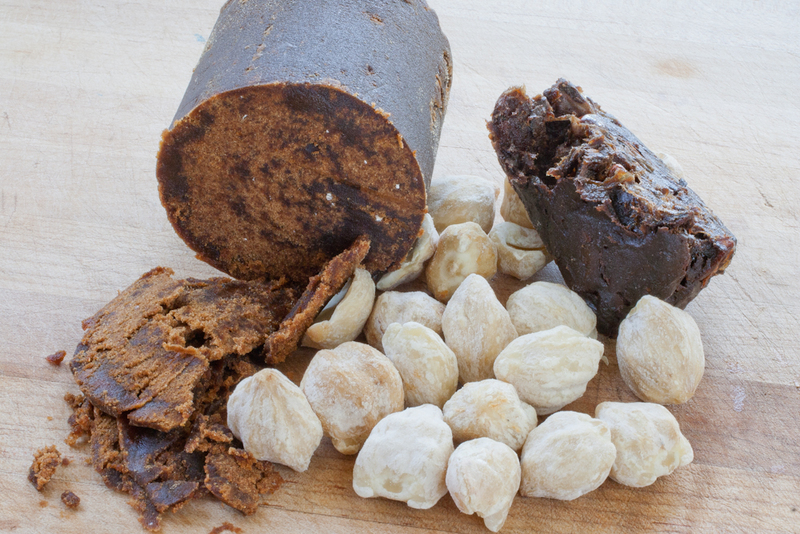 Indonesian dishes often use dark palm sugar or gula jawa, tamarind paste, and candlenuts or kemiri. This is how I served this dish to my husband today, from top left, clockwise: Sambal Tomat, My Perfect Brown Rice, and fresh cut vegetables.